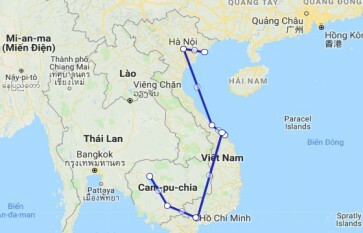 This tour combines the hidden charm of Vietnam and the mystical treasures of Angkor in Cambodia with a unique opportunity to experience the natural beauty and traditional lifestyle found throughout the Mekong Delta… Highlights are visits of two world heritages: Halong bay and Angkor temples, discovery of a captital, an ancient town and an old Vietnam captial. Let’s come and join us for an enjoyable journey. Welcome to Hanoi: Vietnam’s bustling colonial capital. Your driver and guide will meet you outside the baggage claim of Noi Bai Airport and take you to your hotel in the city center. In the afternoon enjoy a cyclo tour through the Old Quarter’s narrow streets lined with French colonial buildings – followed by a traditional Water Puppet Performance – a unique Vietnamese art form hailing from Southeast Asia’s wet-rice culture. Savor a welcome dinner at one of Hanoi’s finest restaurants. Your guide and driver will meet you at the lobby of your hotel then set out on a 3 to 4 hour drive to the UNESCO World Heritage Site: Halong Bay. Note: The below itinerary is subject to change without prior notice and depends on weather condition. It is a sample for our standard service on a 3 star junk/ cruise. Different programs are available through our luxury cruise itineraries on the Violet, Jasmine, Ginger, or Paradise. Please contact us for more details. Spend 24 hours on a traditional Junk Cruise in the amazing bay: a natural wonderland composed of jutting limestone islands and sparkling turquoise waters. Arrive at the dock around noon and board your junk. Savor a gourmet lunch of fresh seafood onboard as we sail out into the mystical bay. 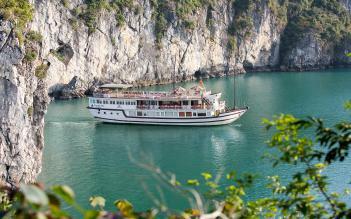 In the afternoon, cruise around some of Halong’s many islands, including Dinh Huong and Ga Choi. Along the way visit one of the bay’s 3 largest caves (Thien Cung, Dau Go or Sung Sot). Stop at an island cove with a sheltered white-sand beach and take a dip in the warm waters of the Gulf of Tonkin (weather permitting). Pass the night on your junk, lulled to sleep by the gentle rocking of calm waters. Awake early and participate in Tai Chi on the top deck or simply relax and enjoy the sunrise over the bay’s towering islands. Enjoy a morning cup of coffee or tea, before setting out to explore the nearby islands by rowboat. Return to the junk for brunch then take advantage of the sundeck and admire the amazing rock formations of Bai Tu Long Bay as you navigate back to Halong City, where driver will meet you at the dock and take you to Noi Bai Airport to catch your short flight to Hue, the former Royal Capital of Vietnam. Upon arrival, get transferred to your hotel in the city. Start your day with a visit to the Imperial Citadel, a vast complex built in the 1800s. With a six-mile wall and a surrounding moat, it was modeled after the Forbidden City in Beijing. In the spacious courtyard area visit the Dien Tho Palace, Thai Hoa Palace, Hall of Mandarins, and the original Nine Dynastic Urns. Travel into the countryside to see the Tomb of Tu Duc. The longest reigning Vietnamese emperor, Tu Duc designed and built this elegant tomb during his lifetime, using it as a retreat for meditation, reading and theater performances. Depart Hue for the scenic mountainous drive to Hoian. Stop at the fishing village of Lang Co for a drink and at the dramatic Hai Van Pass, the high dividing line between the climate zones of North and South Vietnam, to admire the spectacular views. Upon arrival, check in your hotel. Rest of the day you are at leisure. Enjoy time for relaxation as you immerse yourself in the tranquility and charm of this sleepy riverside town. From the 16th to 18th centuries Hoian was a thriving international port frequented by Chinese, Dutch, French, Japanese, Portuguese and Arab traders, who came to trade in the high quality silk still produced in the region. Today, Hoian is a relaxing resort popular with tourists for its eclectic architecture, skilled tailors and numerous cafes. Take a half-day walking tour through the narrow winding streets of the ancient quarter, visiting Chua Ong Pagoda, the Chinese Assembly Hall, the 200-year-old Tan Ky ancestral house and the famous Japanese Bridge. In the afternoon, enjoy free time to shop, explore the town or relax on Cua Dai Beach. Have breakfast at the hotel then drive to Danang Airport to take your flight to Vietnam’s modern metropolis: Saigon. Arrive in the late morning and enjoy an orientation tour through Ho Chi Minh City’s bustling streets en route to the hotel. Have lunch at a downtown restaurant of your choosing then set out on a guided city tour. Yet within this teeming metropolis are 300 years of timeless traditions and the beauty of an ancient culture. Visit the War Remnants Museum, learn about Vietnam’s recent history at Reunification Palace, visit the nearby neo-Romanesque Notre Dame Cathedral and the City's Centre Post Office before passing by the ornate Opera Theatre and the City Hall. Finally, end up at the Ben Thanh Market, where vendors display a vast array of goods and handicrafts, appealing to every taste. Today you spend a day away from the busy city of Saigon and drive to Ben Tre Province. Visit Vinh Trang Pagoda, an ancient southern architectural gem in Tien Giang en route. On arrival at Hung Vuong Pier, board on your private boat for a glimpse at the delta scenery while enjoying coconut juice. Experience the unique lifestyle of the Mekong Delta as you visit fruit orchards, coconut groves, brick workshops, and home-made products such as coconut candies, rice cakes, handicrafts etc. After a short walk to visit a local family to learn how they make sedge mat and enjoy tea, tropical fruits, take “Xe Loi”, a kind of motorized rickshaw or you can hop onto your bicycle and peddle through picturesque villages (about 20 minutes). Stop at a riverside restaurant for a delicious and filling lunch. Then board a sampan for a relaxing trip along narrow canals. The boat will be waiting for you at the pier nearby to bring you back to Ben Tre where your car will take you back to Saigon. Free until your transfer to the airport. Fly to Cambodia’s capital: Phnom Penh. This city was once considered the Pearl of South East Asia and one of the most beautiful in the Orient. Despite its recent turbulent history, its wide tree-lined boulevards and faded colonial mansions hold an undeniable charm. Take a leisurely tour to visit National Museum, the Royal Palace – home to the royal family as well as Tuol Sleng Genocide Museum and Killing Fields, known as Cheoung Ek. After breakfast, fly to Siem Reap, the primary access point for the Angkor Archaeological Park. On arrival, meet your driver then begin your tour at Angkor National Museum for a brief introduction to the history. The modern museum showcases artefacts from the Golden Era of the Khmer Empire by use of multimedia technology to picture this interesting historical period. Experience Angkor at its best on a guided visit to the museum. In the afternoon head to the Happy Ranch Horse Farm (located 10min outside of the city center) and take a trail ride through Siem Reap’s serene countryside. Enjoy an entire day devoted to the mystical and ancient Angkor Temples. After an early breakfast at the hotel you set out to Angkor Thom’s imposing South Gate, topped with the four serenely smiling faces of Avalokiteshvara. Next, visit Bayon temple, the Elephant Terrace and the Terrace of the Leper King. Leaving Angkor Thom by the North Gate, you travel to Preah Khan (Sacred Sword), one of Angkor’s largest temples, constructed in the 12th century by Jayavarman VII. After lunch of traditional Khmer food, head to the mystical, jungle-entwined Ta Prohm temple and then on to the most famous Khmer temple: Angkor Wat. Constructed as a Hindu monument, later dedicated to Buddha, Angkor Wat is the largest temple and finest example of Angkorian art and architect. Immerse yourself in the rich culture surrounding Siem Reap on a boat tour along Tonle Sap Lake. After breakfast at the hotel, take a short walk through a tranquil Siem Reap neighborhood to learn about the local way of life before driving to Tonle Sap Lake to board a local boat for a cruise through the floating villages. Return to Siem Reap for lunch then drive to the airport to catch your departure flight. Good bye & Safe travels! Ethnology Museum is closed on Monday and Friday morning. Bat Trang Traditional Pottery Village will be visited as alternative when the above mentioned places are closed. Full Package A wonderful, action packed, culturally diverse experience with so many added inclusions that made this tour so great. The trip was amazing! loved getting to know all those different cultures and people. The transport and accomodation were good, according to the price of the whole trip. Our guide was excellent se put his heart in her job, she was an expert and she was always smiling and helping us with any trouble we faced.